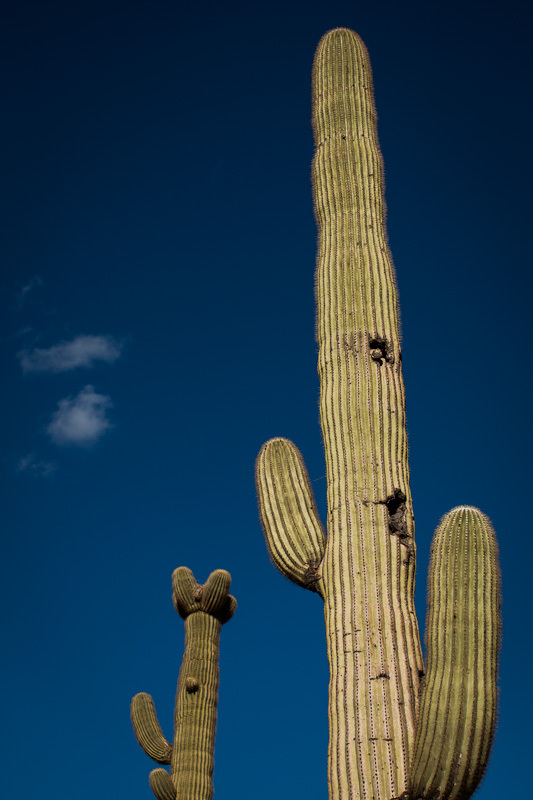 A while back, I posted a brief report on an Arizonan adventure I shared with James. 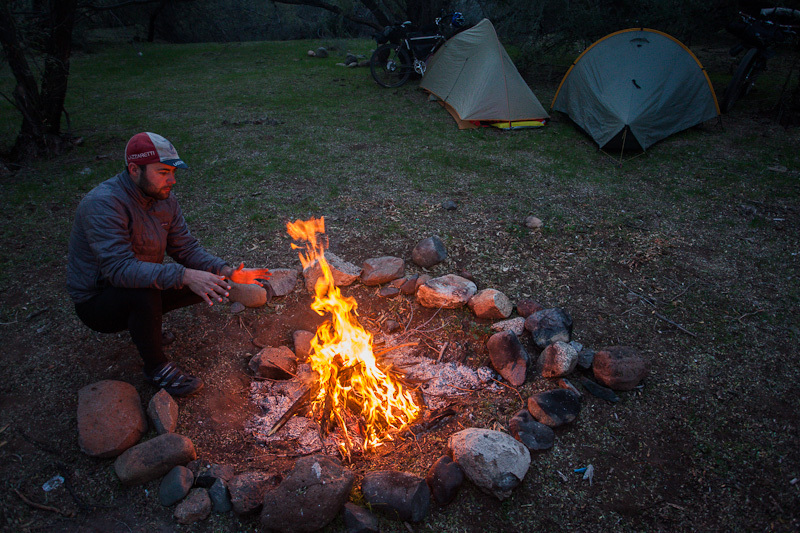 Here’s the full version on our ride from Flagstaff to Phoenix, knitting together segments of the AZT, the Coconino Loop, and the Black Canyon Trail. 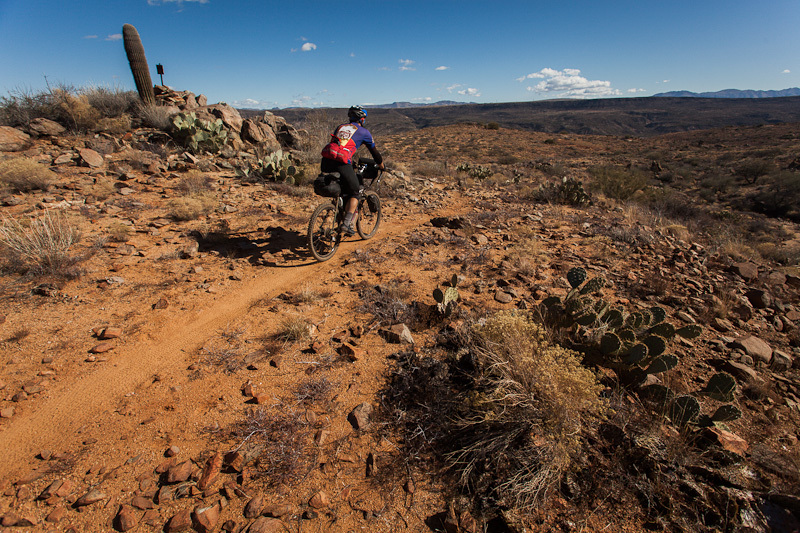 As bikepacks go, this one’s near-perfect if you only have a few days to hand. What’s more, logistics are very straightforward, making it especially appealing. 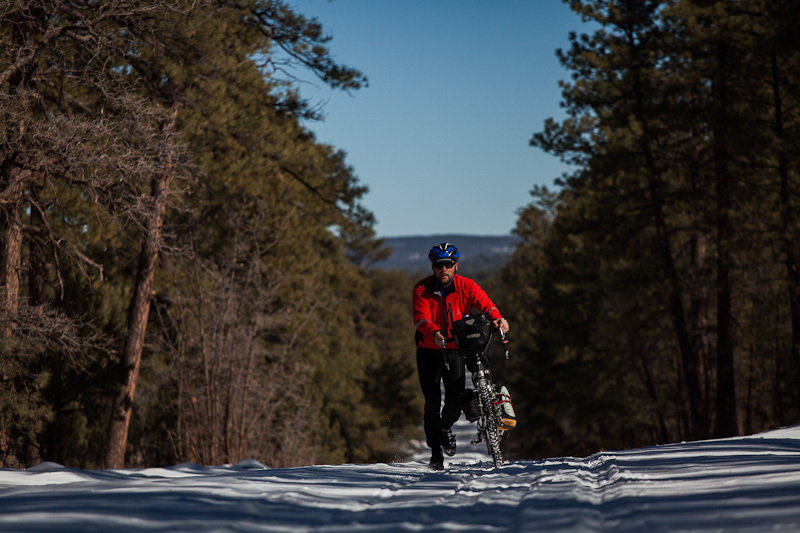 Setting off in January, our route lead us from a snowy and decidedly frigid Flagstaff to a more enticingly summery Sedona, via the Coconino Loop. 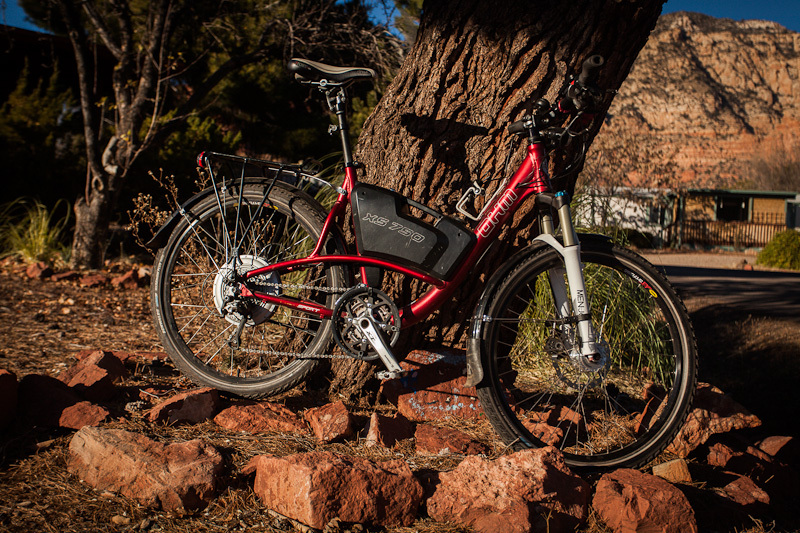 There, we paused to meet up with Electric Bike Report Pete and explore the local trails, famed amongst mountain bikers for both their technical demands and stunning, red rock backdrops. Then, it was onwards and upwards, over mighty Mingus Mountain, veering off towards the diminutive settlement of Mayer (think Circle K, library, motel and not much else). 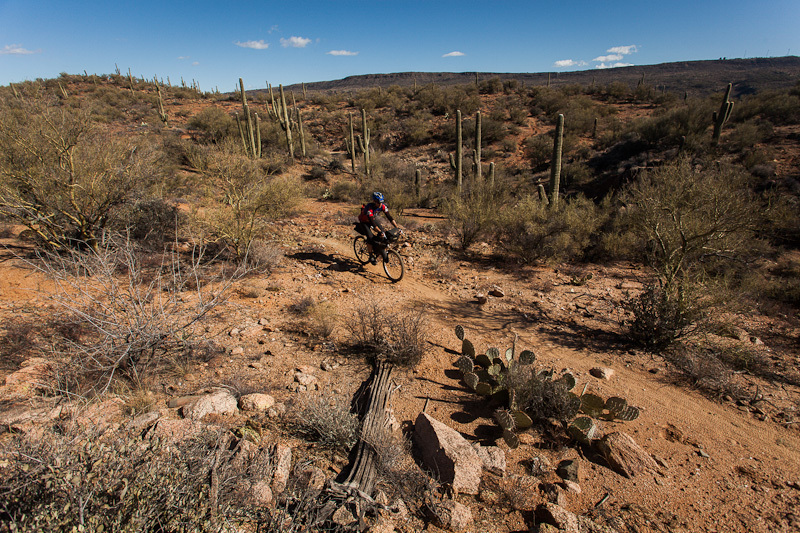 Currently, this is the starting point for the saguaro-themed Black Canyon Trail – 78 miles of parched desert singletrack that hugs the steep canyon sides, wending its way south towards the sprawling metropolis of Phoenix. 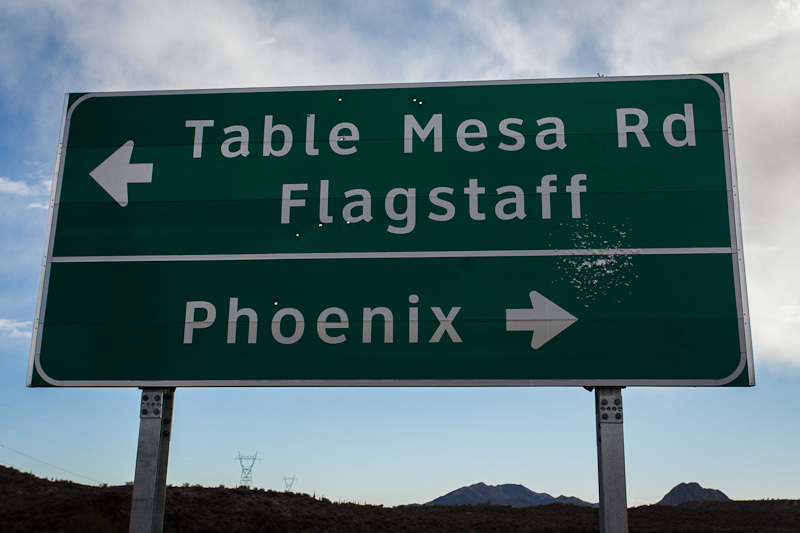 From Phoenix, it’s an easy hitch back to Flagstaff, or there are shuttles available. All in all, it’s a route that deliveries five fabulous days of riding, linking some of my favourite singletrack in the state. 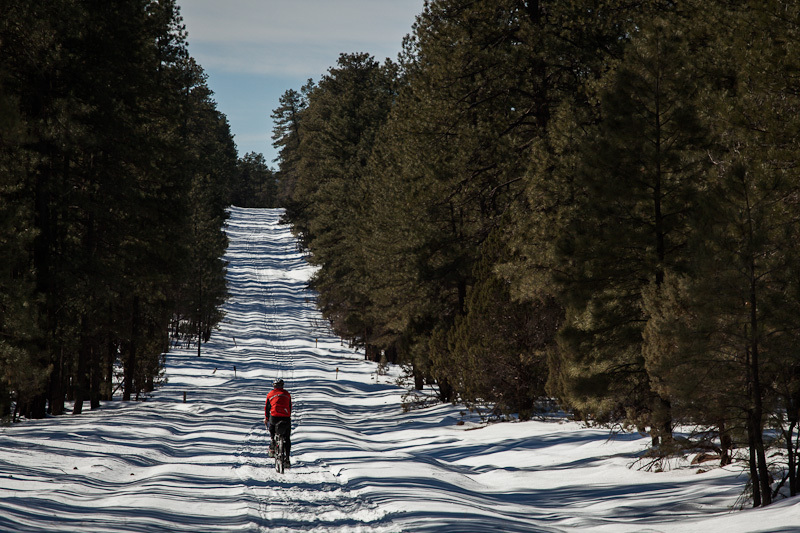 We rode the route in January: no surprise that there was snow in Flagstaff, more unexpected was a cold snap that had us shivering in our tents further south. Full ride details can be found after the photos. 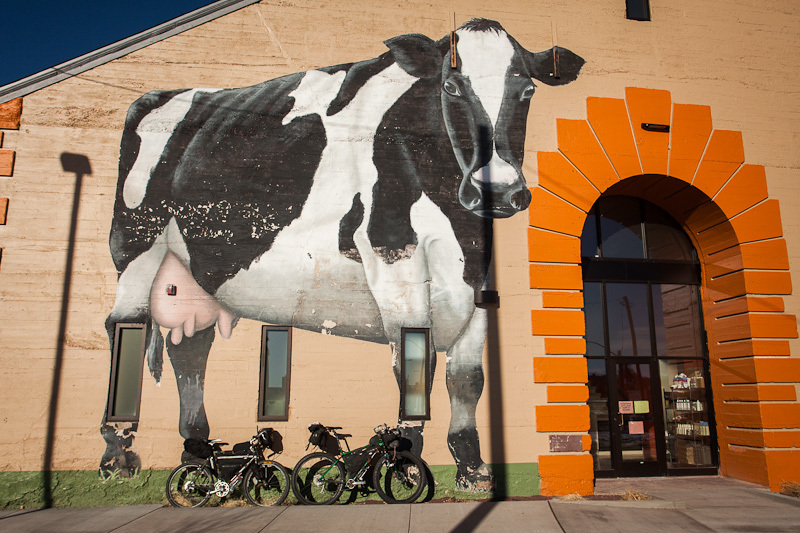 Obligatory ‘loaded bikes against a mural’ shot. Note how the Krampus’ 29+ tyres dwarf those of James’ 26in Long Haul Trucker. 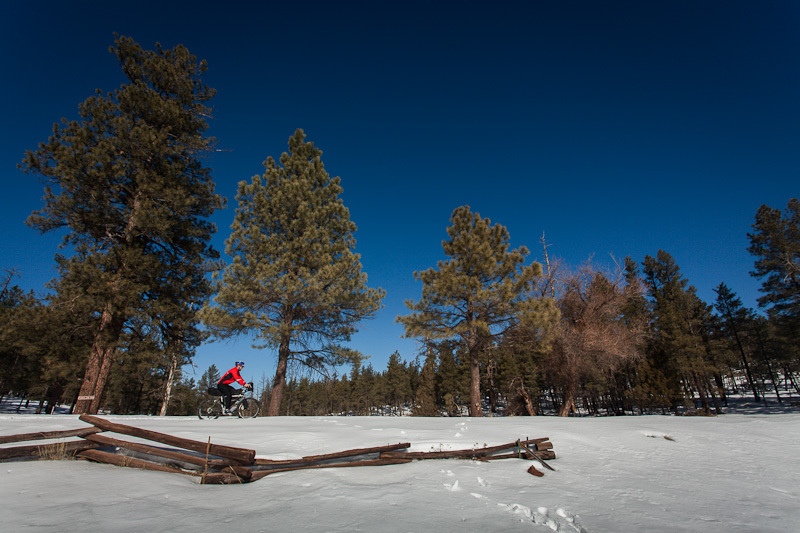 Schnebly Road was closed to traffic and heavily carpeted in snow. It was slow going, but mostly rideable – especially on the Krampus. Obligatory shot 2. The view from Schnebly Hill lookout. Then, snow gave way to dirt, and I was able to lay some signature Knard tracks. The Old Munds Wagon Trail. 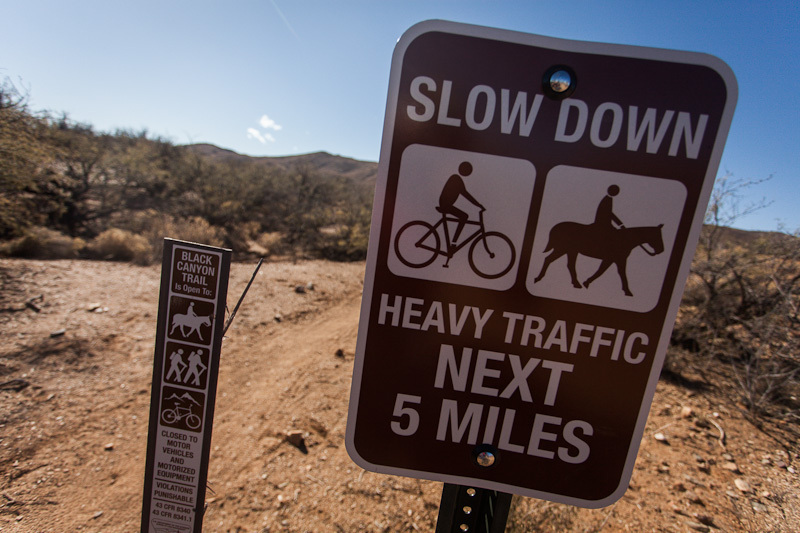 The trail twists sharply downwards, crossing Schnebly Hill Road as it goes. As usual, this was a job for the GPS. Until I figure out a way of mounting the iPhone and keeping it juiced up, my Etrex is the navigational method of choice for this kind of ride, where turns are frequent and largely unsigned. 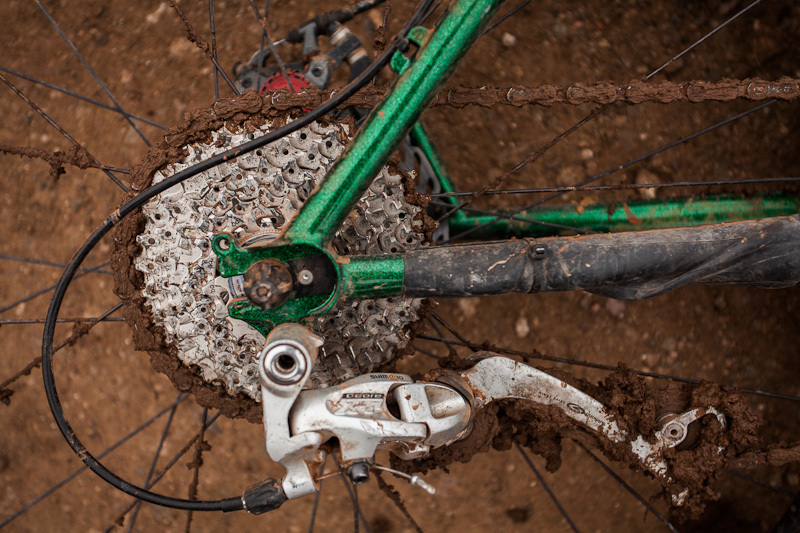 Aside from being an ex MTB racing pro, Pete is also an electric bike nut, and runs Electric Bike Report. This BionX powered BHM was one of the bikes he had in on test. After a brief test ride round the block, I was impressed. Unfortunately, James took a tumble on the old Munds Road, when his Anything Cage – hose-clamped onto his fork – swung into his front wheel. A borrowed wheel (thanks Pete!) was required, and the folks at Over the Edge Cycles were kind enough to get the Long Haul Trucker back up and running in no time. 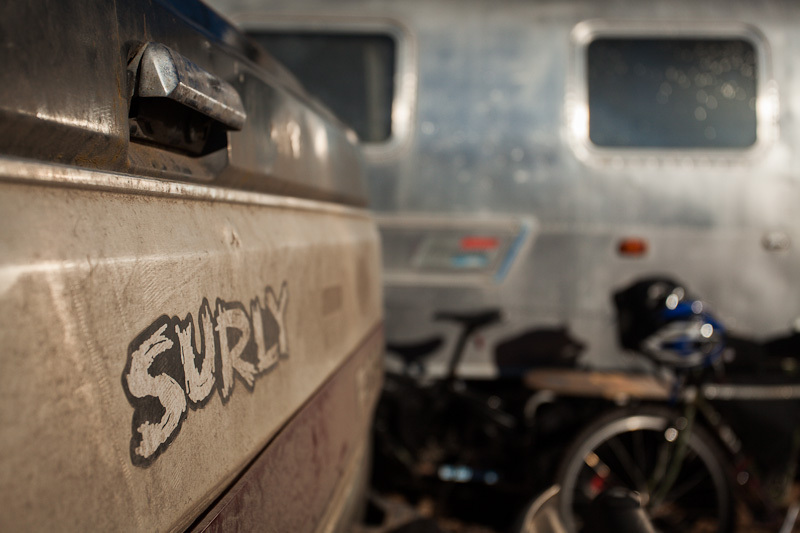 There, we met fellow Surly-nut Bammer, living out of his solar-panel powered airstream behind the shop. 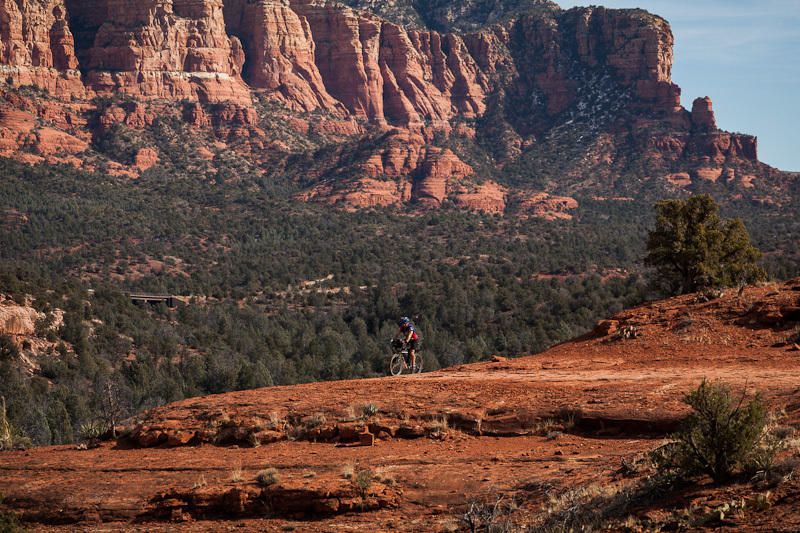 Then it was back on the trail, following the Broken Arrow Trail, one of my favourites when it comes to classic Sedona views. 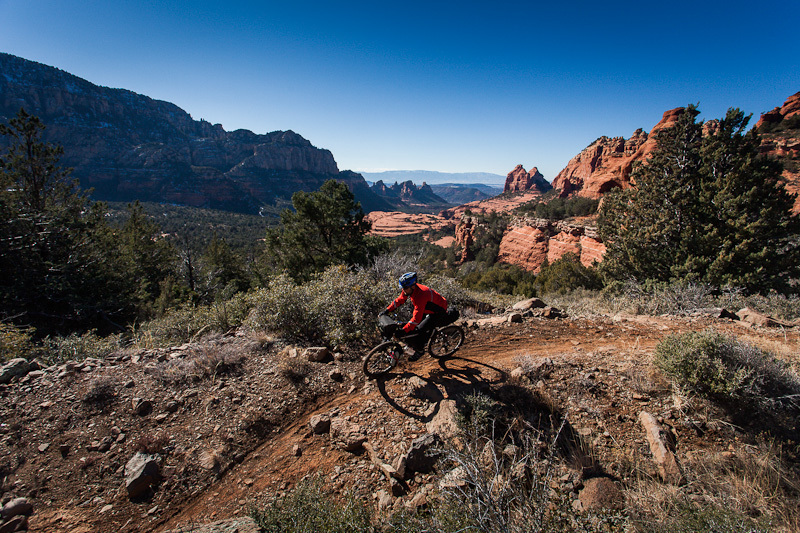 More sublime red rock riding. 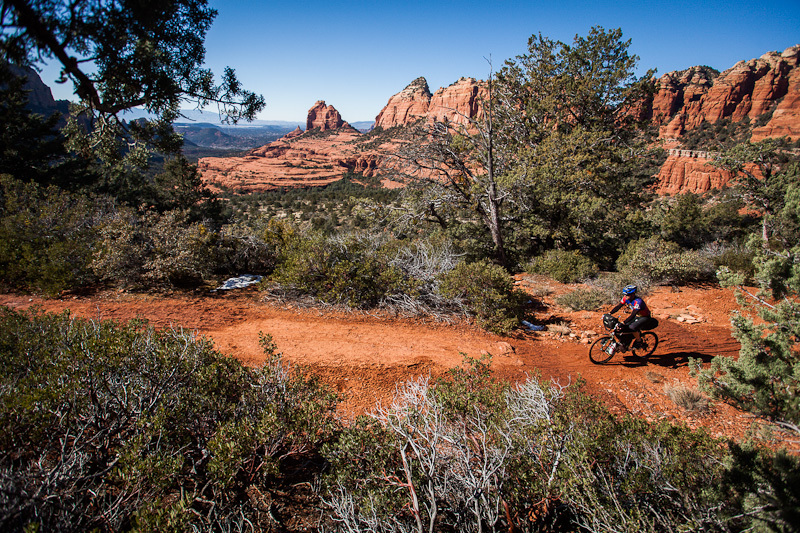 Sedona is relatively well signposted, at least on the more established trails. You can pick up a local trail map at Over the Edge. 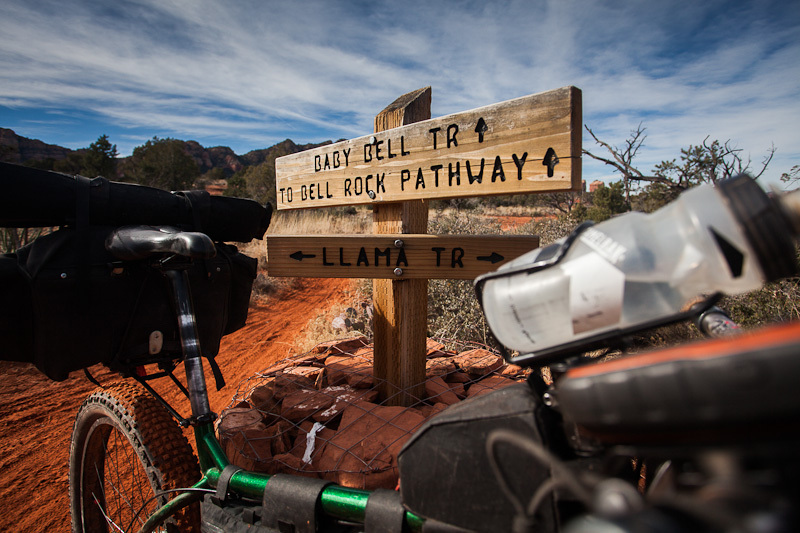 Then, we were leaving the red rock behind, as we connected with Lime Kiln Road, a dusty singletrack trail heading out towards Cottonwood. Late afternoon light. My favourite time of the day. After a cold night ghetto camping behind the Safeways in Cottonwood (our hangout to keep warm), we forged on up Mingus Mountain. 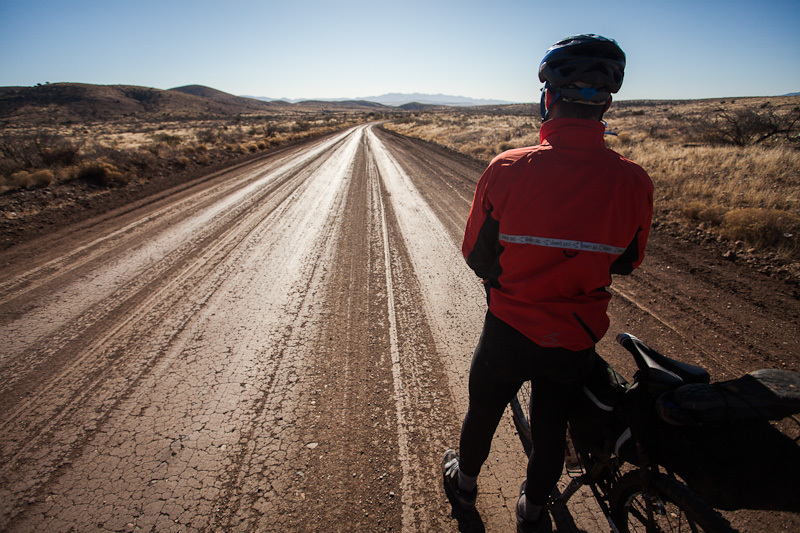 The dirt road challenged us with steep, loose pitches in places. 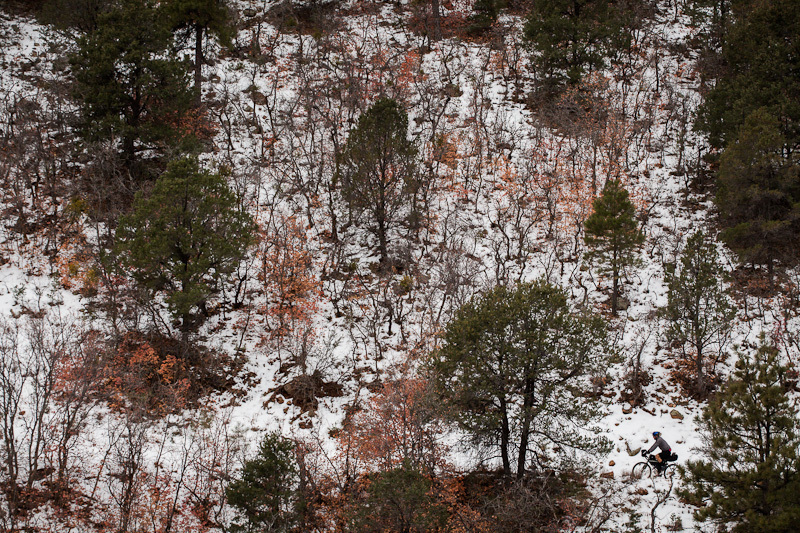 The GPS guided us along icy, snowy trails. Who knows how we’d have found them otherwise. 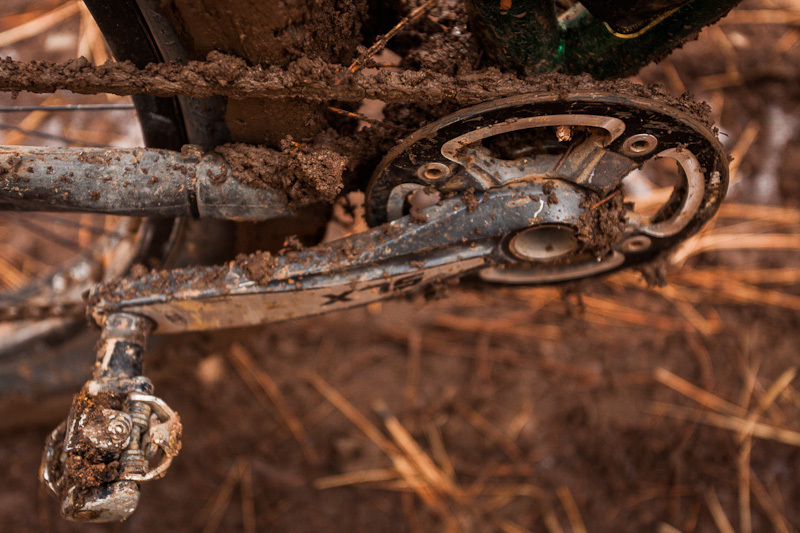 Fortunately, the muddy stint was brief. 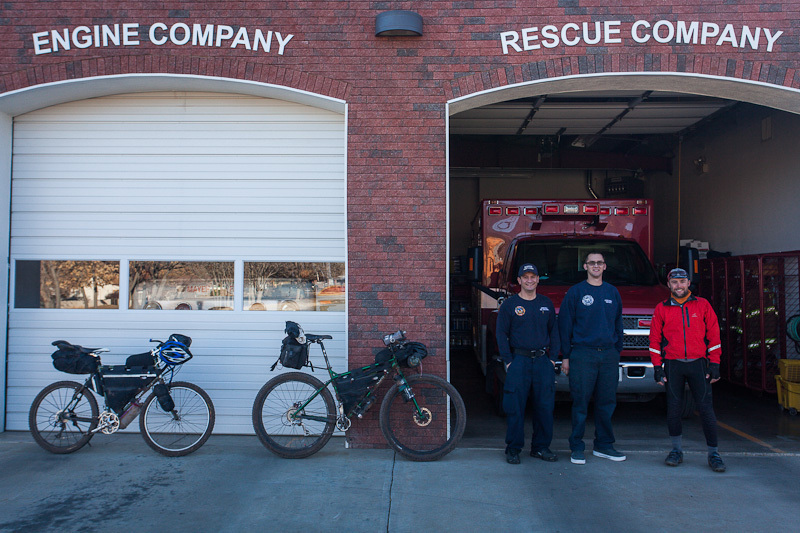 Later that evening, we camped opposite the fire station in Mayer that night, borrowing their blankets as more snow was forecast. That’s more like it. Sun again. Arizona. 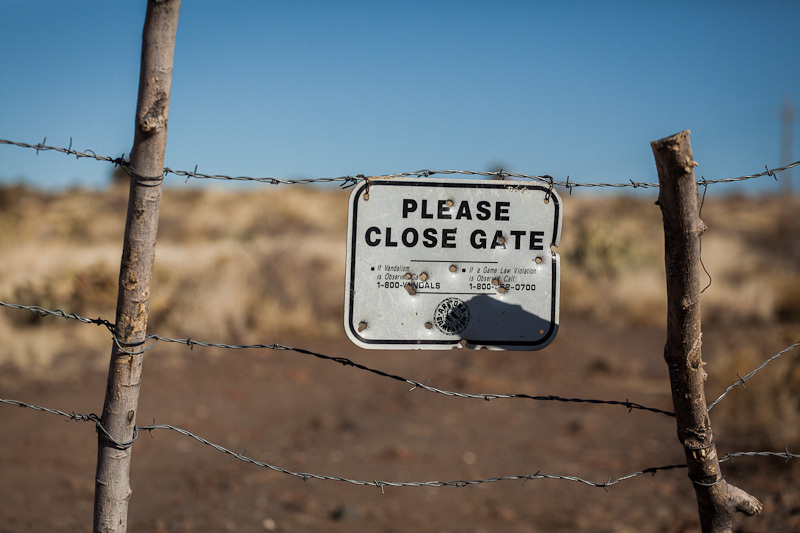 Where there’s a sign, there’s a bullet hole. Picking up the Black Canyon Trail, we bumped into a couple of James’ friends from Flagstaff who had come to ride for the day. The BCT is only recently completed. Plans are afoot to link it to Prescott. Heavy traffic? We saw just a handful of cyclists out on day rides. And three horses. In two days. 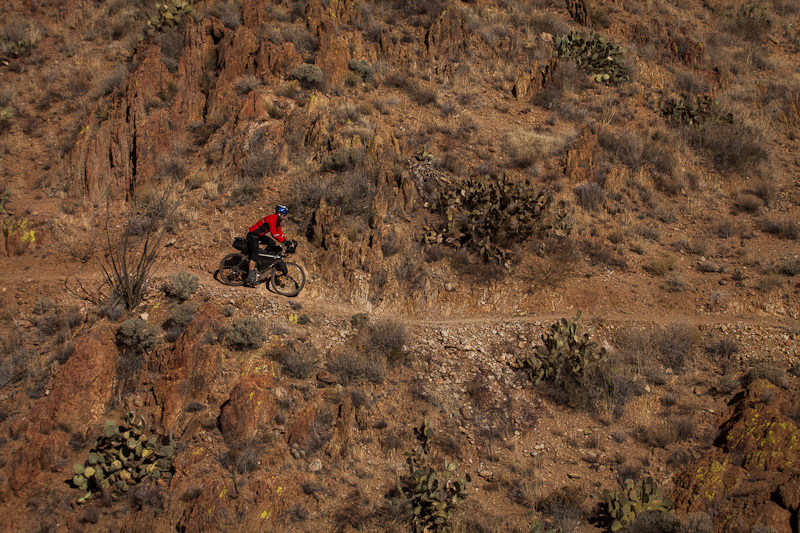 For the most part, the terrain was easy going and flowed beautifully, with a more loose, challenging descent into Black Canyon City. 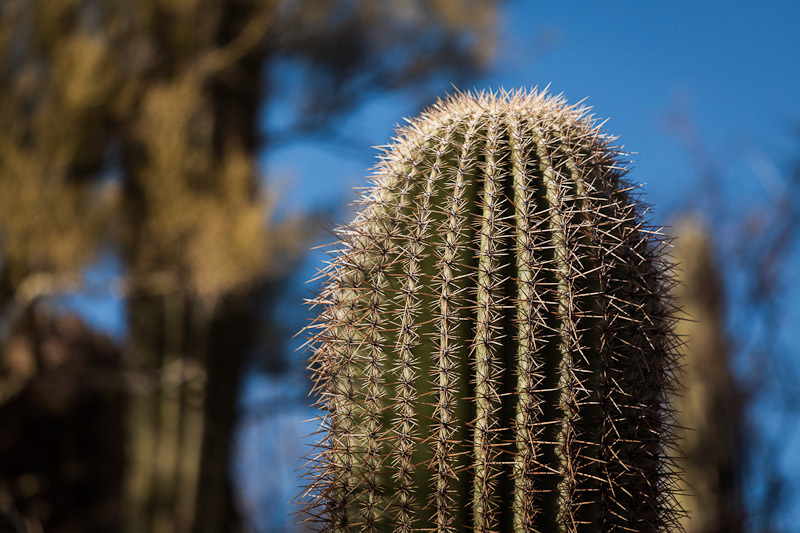 More prickliness. 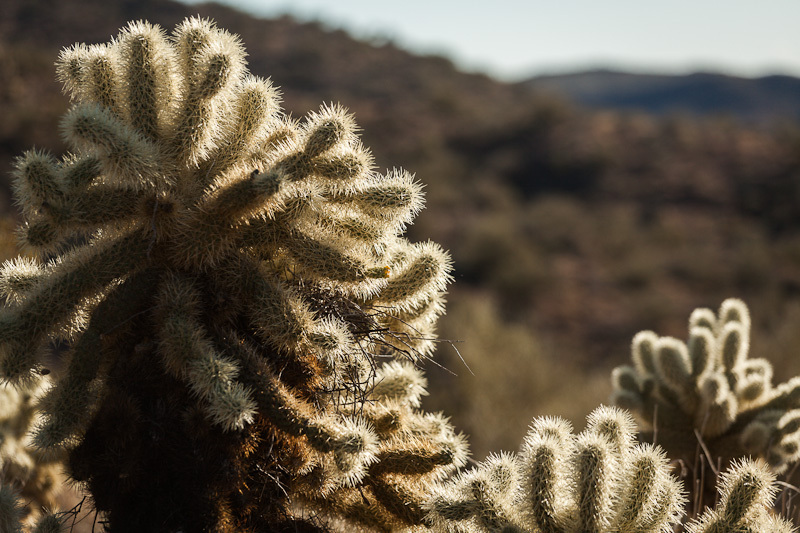 Cylindropuntia fulgida. 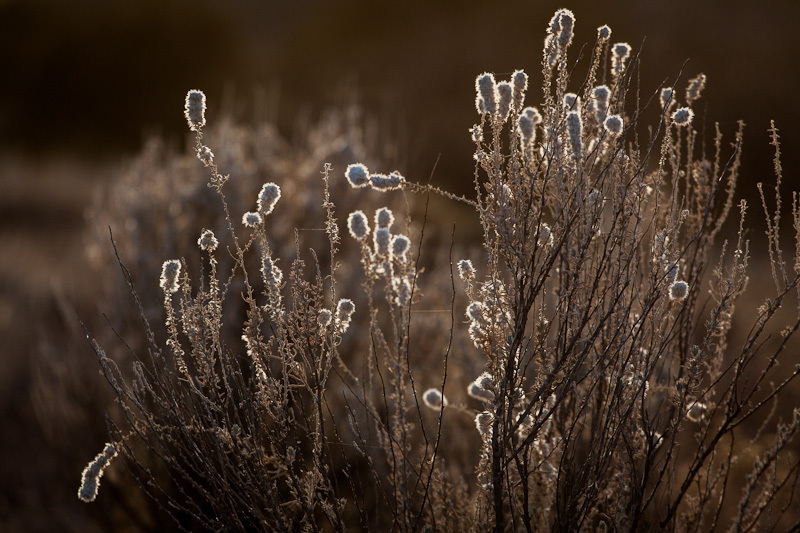 Also known as Jumping Cholla. 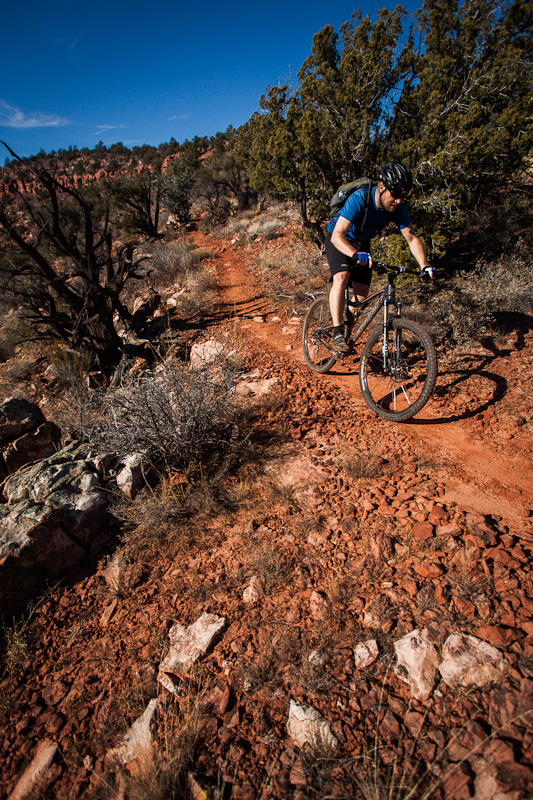 The slightest hint of a breeze or shake releases them onto body and trail. 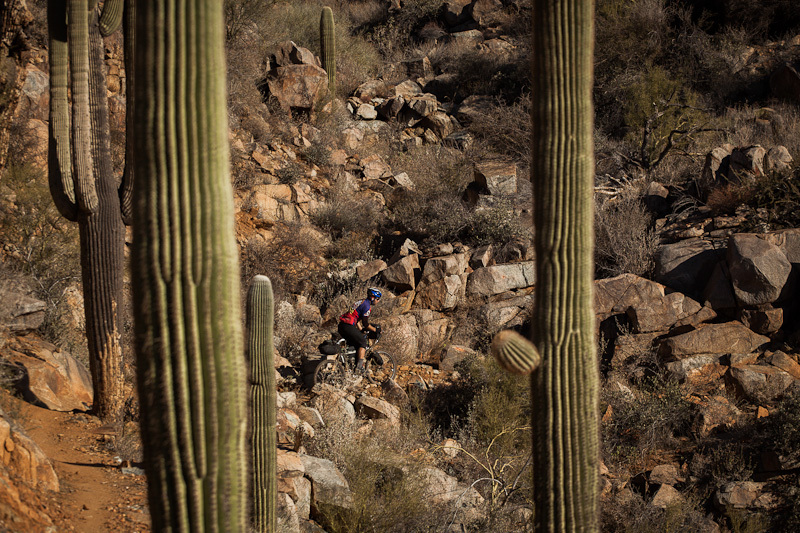 Weaving through an alleyway of beanpole saguaros. Our campspot in Black Canyon City. 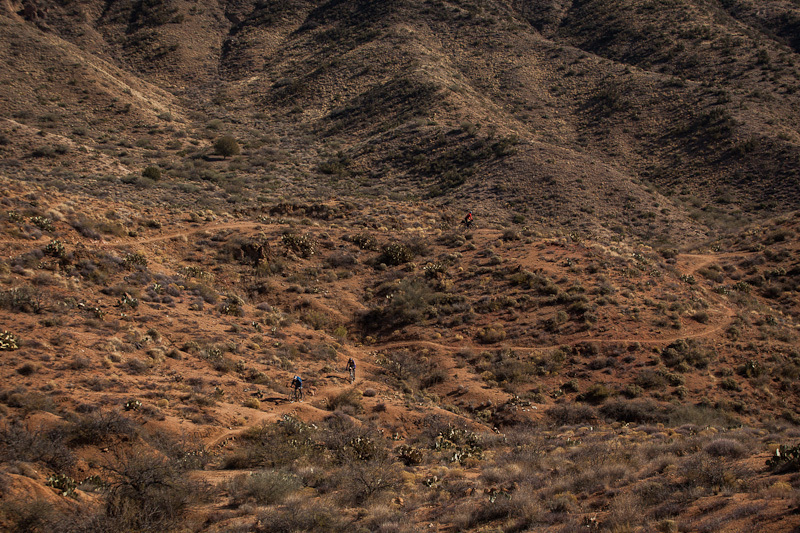 Back on the BCT, crossing one arroyo after the next. We only had time to ride to Table Mesa Trailhead on our last day, a little shy of Phoenix, as I had to get home to New Mexico. Thankfully, I hitched a ride all the way to Santa Fe from a gas station in Cortez Junction, arriving late that night. 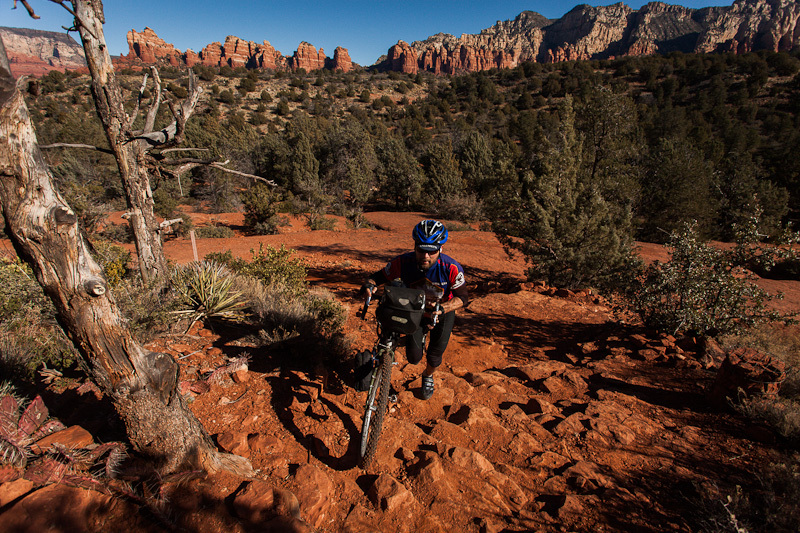 We followed a gpx file that connected Flagstaff to Sedona to Phoenix, predominantly on singletrack and dirt. 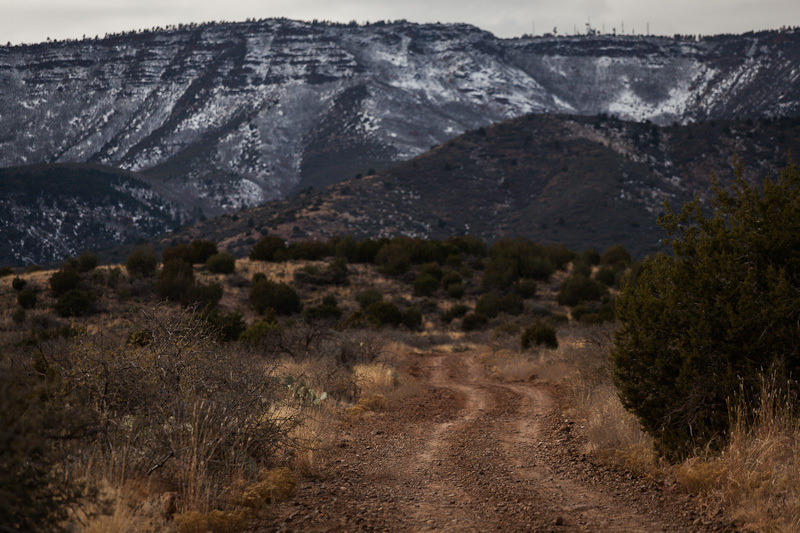 As such, it linked the AZT south of Flag with the Coconino Loop, branching off towards the BCT. 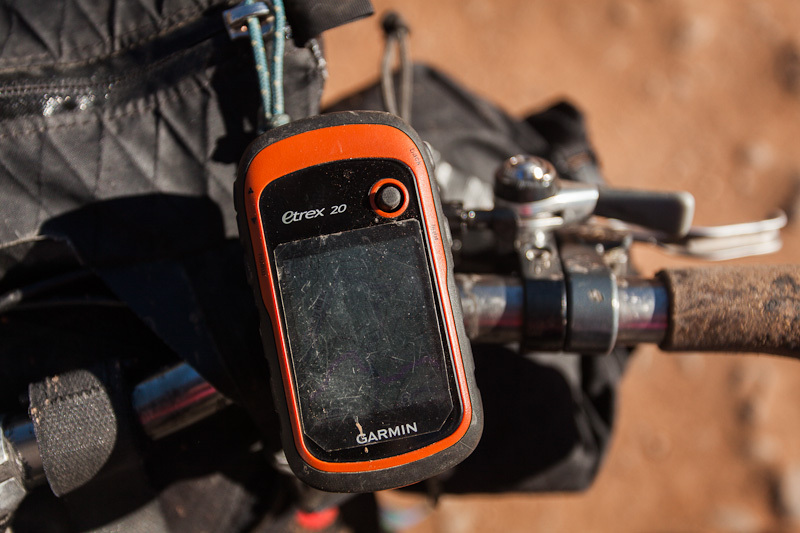 I’m sure it will be available on Bikepacking.net at some point. 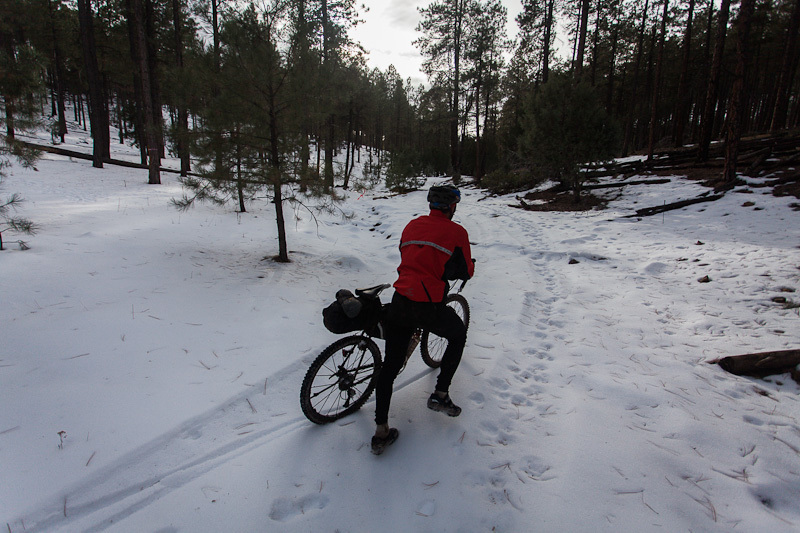 Being January, we skipped the AZT out of Flagstaff, which was under snow and mud, and headed straight for Schnebly Road. 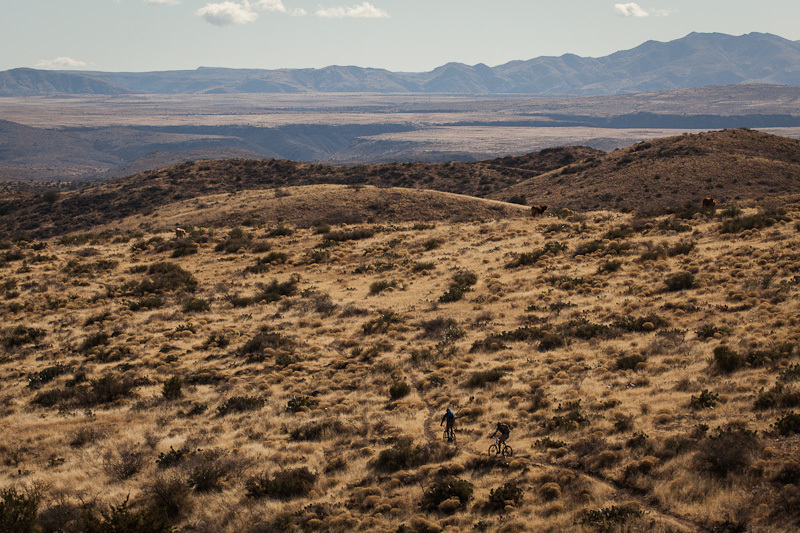 It’s a lovely section of trail though, so don’t miss it if you’re riding later in the year. One of the beauties of this ride is how logistically straightforward it is. Flagstaff is on I-40 (I found a rideshare from Santa Fe) as well as the train line between LA and Albuquerque ($15 for a bike). It’s easy to get from Phoenix back to Flag by hitching, as we did. Gnar Gnar tours also run a Black Canyon Tours shuttle service. 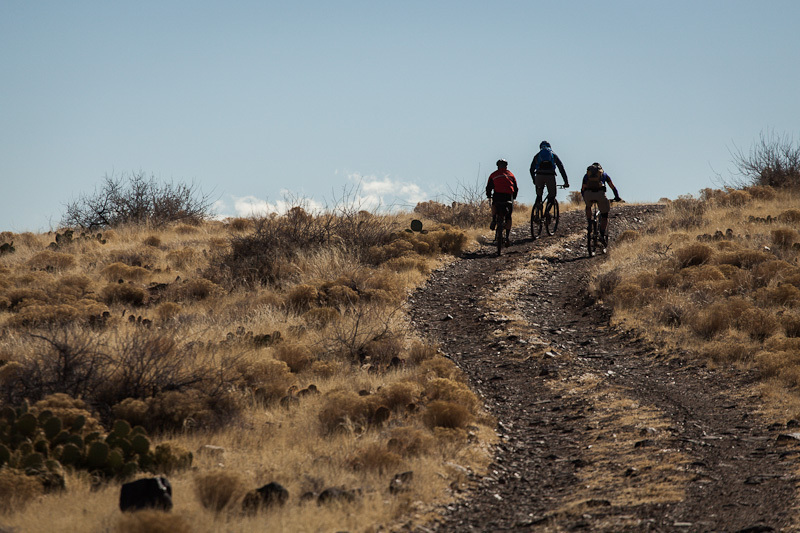 Luckily, keeping hydrated wasn’t an issue for us at the time of year we rode it – ride it later in the year, and you’ll need to carry a day’s worth of water on several occasions. 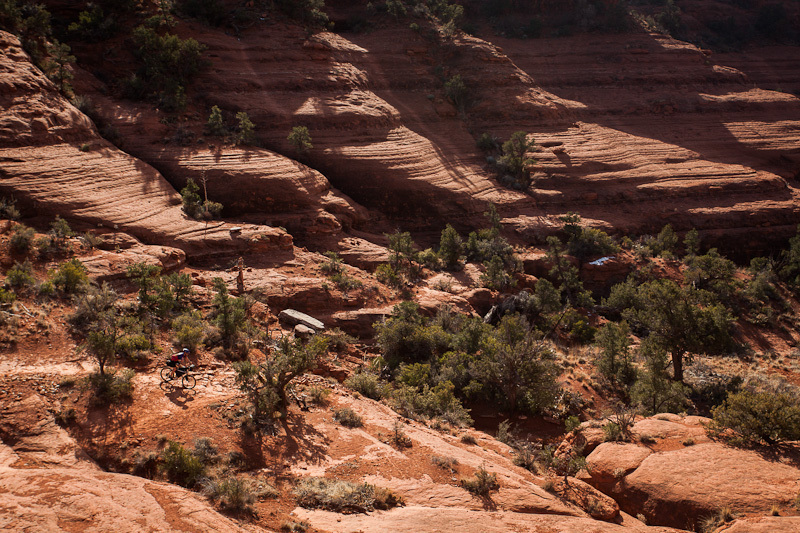 You can load up in Flagstaff, Sedona, Cottonwood, Mayer and Black Canyon City. These same settlements have full services. 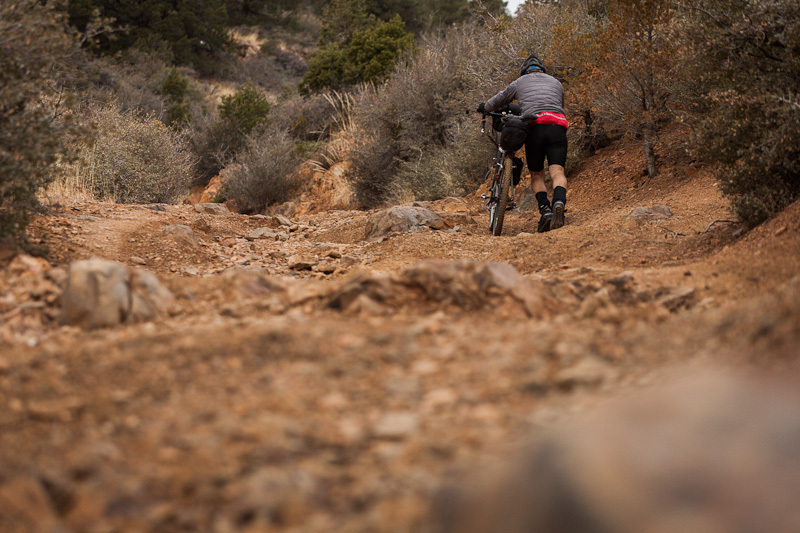 James rode his trusty, drop barred and inherently versatile Long Haul Trucker, defying technical descents and rock gardens alike. It worked, but it wouldn’t be his steed of choice next time, given the challenging terrain. His gear was a mixture of Porcelain Rocket (custom framepack and front roll) and Revelate (seat pack). I rode the Krampus, tweaking my usual Porcelain Rocket setup with a Carradice Super C saddlebag. Neither of us rode with backpacks. 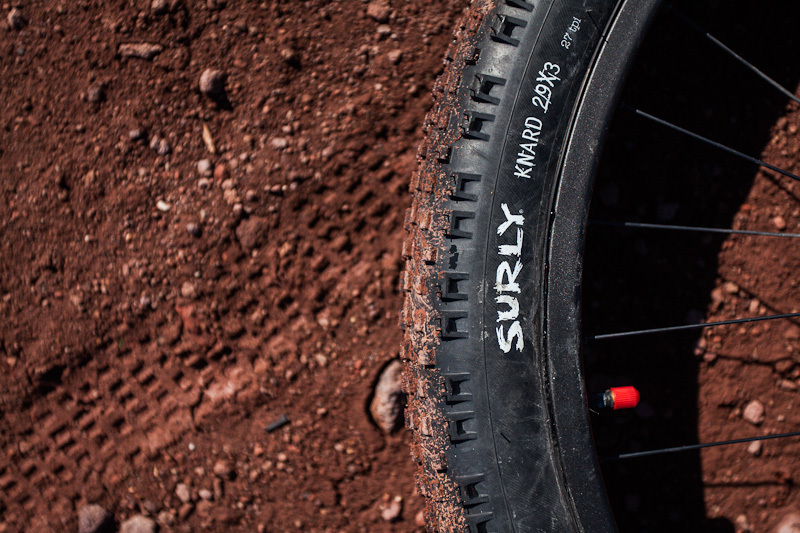 We both ran tubeless, and didn’t suffer from any punctures, despite the prolificacy of cacti. 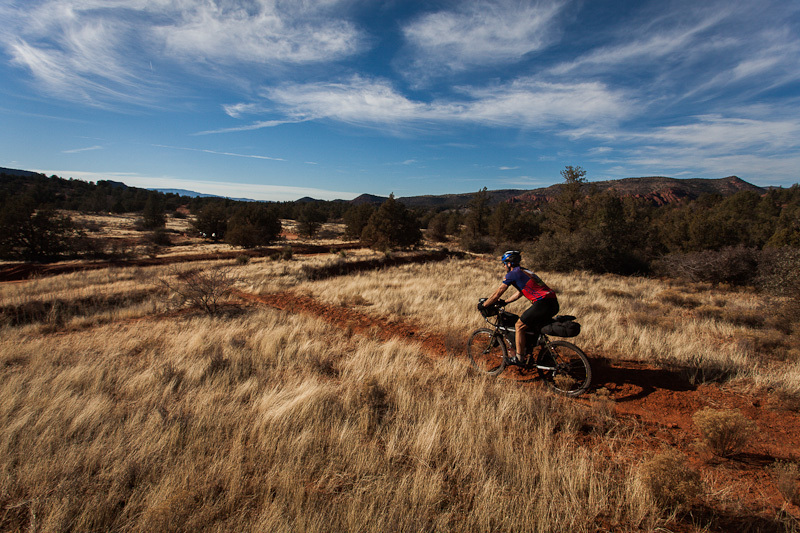 For this kind of backcountry, singletrack touring, a handlebar-mounted GPS really maintains the flow of the ride. Canon 5Dmk2 with 17-40mm and 70-200mm f/4 lenses. To James for his companionship, and to Tim and Topofusion Scott for sending us a gpx file of the route – which made navigation a breeze. 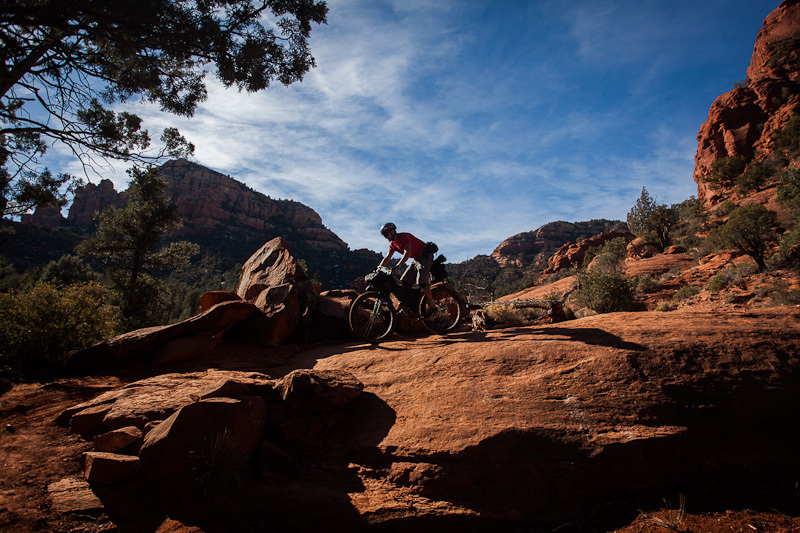 Thanks too to the folks at Over the Edge, Sedona, for helping James resuscitate his bike back life, after a nasty fall on the Old Munds Wagon Trail. And to the firemen who invited us in from the cold. And to those who reacted to our outstretched thumbs and gave us a lift – especially you, Emile! I really do love reading your work, come see me in the Canyon! Can’t wait to come check out your new digs. Awesome ride. And in winter to boot. Wonderful pictures. Definitely will have to try some or all of it. You’re right about carrying water. That poses a problem in October, when the weather is perfect but the water sources limited. 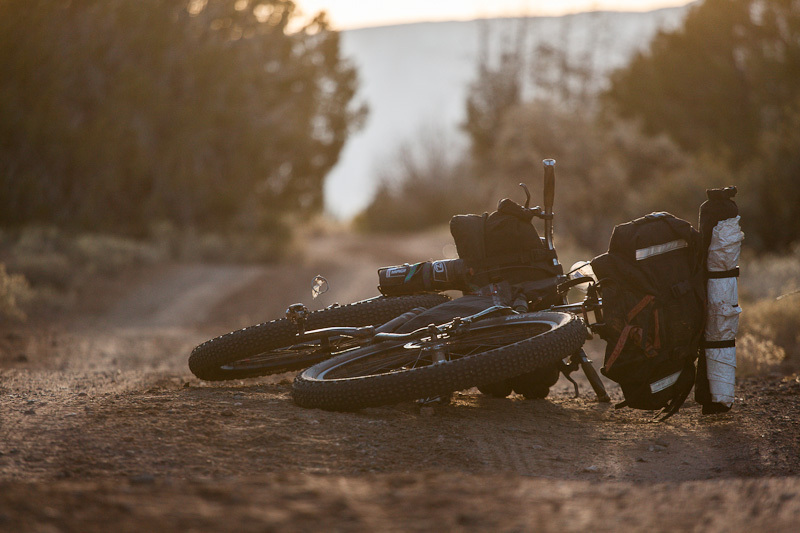 Was the long haul trucker a good choice for bike packing? 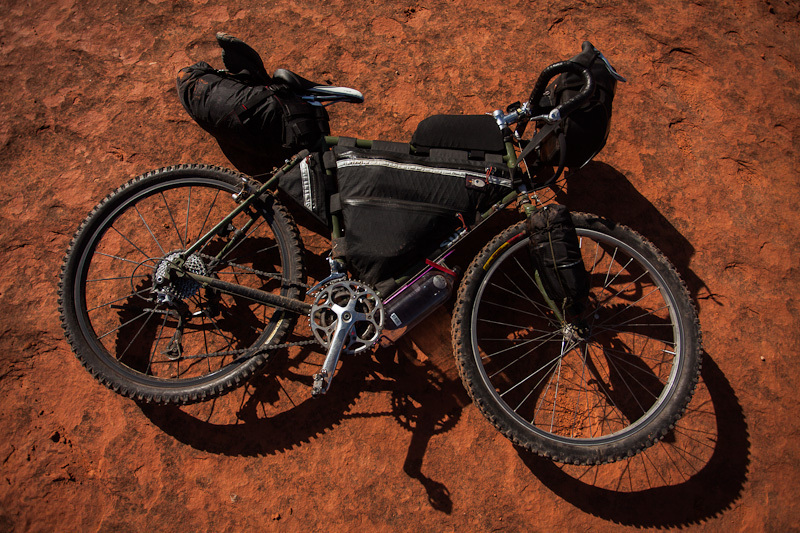 I am trying to decide between outfitting my full suspension mountain bike or my long haul trucker for my first bike packing trip. Hi Ryan, it very much depends on where you’re heading/the kind of terrain you’re expecting. 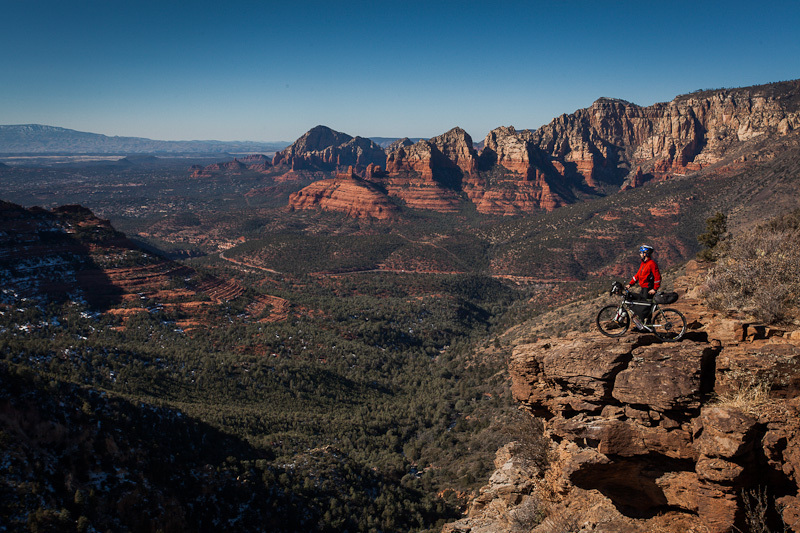 But if it’s a trail orientated trip, I don’t think the LHT is the best option.